Alfredo Catalani; Gaetano Donizetti; Georges Bizet; Giacomo Puccini; Gioachino Rossini; Giuseppe Verdi;... Very Good. In very good packaging. 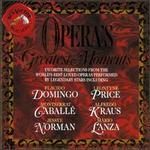 Mario Lanza-Opera's Greatest Moments [IMPORT] by Mario Lanza. Fair. Buy with confidence-Satisfaction Guaranteed! Satisfaction 100% guaranteed. Like New. Like New condition. Audio CD. Case Very Good. BMG edition. Quality guaranteed! In original artwork/packaging unless otherwise noted. EX. Domingo, cabelle, norman, price, kraus, lanza. Like New. Like new, plays perfectly. FAST shipping, FREE delivery confirmation and online tracking. Thank you! New. Brand New and Unused. Factory sealed. Small overstock hole to the cast in the top right corner. Very Good. Perfect disk surface with no scuffs or scratches. In lightly scuffed jewel case with liner notes. (Shelf location: V2D) All items carefully packed to avoid damage from moisture and rough handling. Tracking included.